Guns have had played both an indirect yet also tangible role in the rise and progression of global powers and industrial development over the course of history. In modern times, they hold an ambiguous role that ranges from heated debates between aspiring politicians to the topic of the evening around the household dinner table. The history of guns rides right along with the evolution of our armies and play a key role in changing the way wars were fought. This dates back to the early days of the 10th century and all the way up to modern times. During this time guns have experienced intense technical advances and economic developments that have increased the practicalness and also the lethality of guns. The first gun and gunpowder are widely regarded, although still disputed, to come from China during the 10th and 9th century, respectively. In the 10th century, the Chinese invented “Fire-spurting lances” which consisted of a bamboo rod or a metal rod to hold the gunpowder or the “huo yao”, which means fire-chemical. Huo Yao was an ancient Chinese invention that was actually used historically as a cure for indigestion. While Chinese alchemists were actually seeking the elixir of immortality they accidentally discovered the volatile and explosive elements of this black powder. The fire-spurting lances were used during the Jin-Song wars within the Song dynasty era that began in 960 to 1279. These fire-spurting lances are recorded as the devices that were the first guns and also the first known use of gunpowder, in war or otherwise. The design of the fire-spurting lance was generally a small bamboo or bronze/iron casted rod that could be operated by a single person that would spew fire and lead balls at their opponent. The Chinese also created a more cannon-like device that would be held up by modern wooden frames and spurt gunpowder filled bombs that would explode upon impact causing great confusion and disarray and of course, death. These proto-cannons were aptly named Flying-cloud Thunderclap Eruptors or Feiyun Pilipao, in Chinese. These devices which mark the first uses of gunpowder-based weapons and artillery were described in detail in the Huolongling or the Fire Drake manual. This manuscript was written by Jiao Yu and Liu Bowen who were military officers, philosophers, and political advocates during the early Ming Dynasty (1368-1644). The Europeans first started receiving gun powder from the Chinese, as well as silk and paper, via the Silk Road trade route. As Europe received the gunpowder it was applied rather quickly to the cannons in the battlefield which were part of the early 13th-century technological advancements which began to mark the end of the medieval era. The cannon became quite popular as it annihilated troops regardless of their fast horses and heavy, steel armor. After the initial invention of cannons, the concept of firing a big fiery ball of lead towards the enemies began to be conceptualized into a device that could be handled and operated by individuals. This conceptualization resulted in what is the first known hand-held gun and is referred to as the Hand-Cannon. It is essentially a hunk of iron that is hand-forged into two parts. The first part was the long barrel part to hold the projectile and a pole or handle that the gun wielder would hold. To fire the weapon the wielder, or sometimes an assistant, would hold a live flame to the end of the barrel that would ignite the gunpowder and fling the projectile outwards. Ammunition was generally sparse in the 13th century so anything would be used in place of an iron ball such as stones, nails or anything else they could find. The Hand-cannon grew in popularity over the course of the 13th century. The weapon had many characteristics that rendered it useful above that of swords and bows in favorable circumstances. Archers and swordsman required lifelong devotion towards their practice to be able to attain a level of skill that was useful in battle. The hand-cannon was able to be used skillfully with very little training and was also cheap and able to be produced in mass quantity. As far as the effectiveness in battle, it was used most effectively as a flanking weapon and also in cohesion with archers and swordsman by flanking the enemy and causing confusion for infantry to penetrate the enemies defense. To fire this hand cannon into the flanks of the enemy, either with lying it on a rest to fire it alone or with an assistant, caused the enemy to quickly lose morale as deaths piled up. The psychological damage this weapon caused was extremely effective as the projectiles fired from the hand-cannon would penetrate through the armor that knights wore in the 13th century. As time went on from the beginning of the 13th century, inventors were constantly refining and adapting firearms to rectify the most common problems faced by militia attempting to use them. This included the slow reload time, the accuracy of the devices, refining them down to be used by one person and also address the problem with the bulkiness of the firearms. The matchlock was designed in the early 15th century and revolutionized the advancement of hand-held firearms. It was a device that used an S-shaped arm that held a match and had a trigger that lowered the match to ignite the powder held in the pan on the side of the gun. This ignition then would light the main charge that would fire the projectile out of the barrel of the gun which allowed the user to relinquish his aide in firing the weapon. Rifling was one of the many improvements on firearms that served to advance the exciting realm of firearms in their accuracy in the early 16th century in Augsburg, Germany. Rifling involved cutting spiral grooves on the inside of the barrel of the gun. This allowed for the projectile to obtain a spin while shooting out of the barrel which, like an arrow, allowed the bullet to maintain its directional course which greatly improved the accuracy, similar to fletching feathers to an arrow. The reload speed of firearms was addressed initially at the beginning of the 17th century through the invention of the flintlock which was primarily used on musket invented around the same time. Through further improvements by the time of the Revolutionary War was being fought soldiers were able to fire up to 3 times a minute which was a huge improvement from the 1 shot per minute of the initial musket in 1615 A.D. This can also be compared to the hand-cannon which fired at a rate of about 1 shot per 2 minutes. The Colt Revolver was invented by Samuel Colt in 1836, died a wealthy man due to his innovation. This included the revolution of a gun that can fire multiple bullets without being reloaded and Colt also introduced the idea of interchangeable parts which greatly lowered the cost of servicing weaponry when pieces of the weapon were worn and broken and also allowed Colt to pump out 150 weapons per day in 1856. Initially, after the invention of the Colt, Samuel Colt’s business flopped. However, when Samuel Walker approached Samuel Colt he promised Colt a contract of 1,000 revolvers to be used in the Mexican War if Colt could re-design them to fit Walker’s specifications. Colt met these specifications which would later be named the Colt Walker and far surpassed the other revolvers of its time. The Colt Walker had it’s weight greatly increased to about 4 ½ pounds, up from the average weight of 2 pounds of the Colt Paterson. This increase in mass allowed for a .44 caliber bullet up from .36 and the weapon also become a six-shooter instead of a five-shooter. Walker also added his own designs to the Colt Walker which included a trigger guard, a loading lever, and a front sight rendering the weapon effective against man or beast and up to a range of 200 yards. The designs of the shotgun we see today were implemented by John Moses Browning around 1878. He designed the pump action, lever action, and autoloading shotguns that are still in use, albeit improved upon, today. The shotgun was considered a hunting weapon and has no distinct invention date that has been recorded. It was primarily used in fowling by the Britains in the 16th and 17th century and of course onwards into today’s era. There is really no invention date of the shotgun, short of the invention of firearms themselves. Defining a shotgun as a device that fires multiple projectiles at once would determine that even the Chinese using their fire lances or flying cloud thunderclap eruptors would simply pile a handful of stones into the device and suddenly they had what we would call a shotgun. The Gatling Gun was invented and patented by Richard J Gatling in 1862. The Gatling gun was a hand-cranked machine gun capable of firing bullets at a very high rate. Gatling approached Colt in order to have his guns manufactured and then sold. It was the first gun to solve the problems of reloading, reliability, and maintaining a sustained rate of fire. The Gatling gun was first used in the Civil War by Benjamin F. Butler of the Union army in the trenches of Petersburg, VA. It was later used in the Spanish-American War with some improvements that included removing the carriage and putting it on a swivel to adapt to the enemy changing positions more quickly. However, even with Richard Gatling modifying and improving his design it was ultimately overcome by the Maxim gun. The Maxim Gun was invented by Hiram Maxim in 1884. 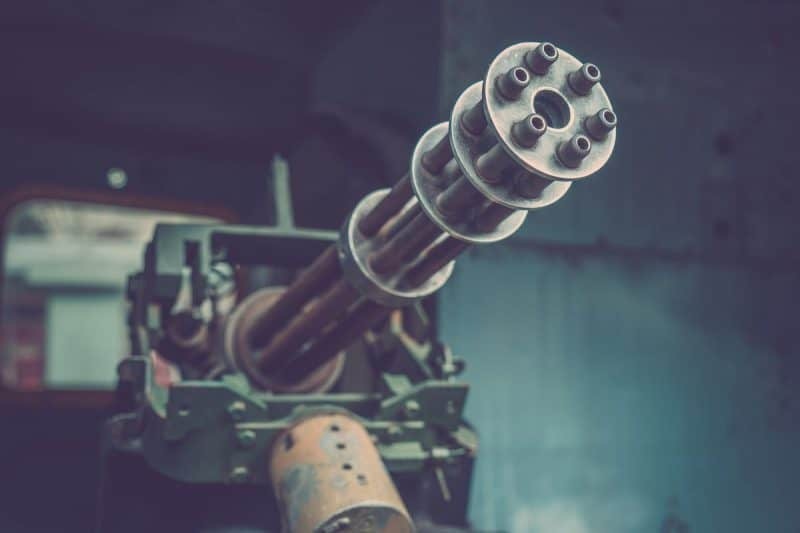 It quickly became adopted as a standard military weapon and was used largely by the British army in World War 1 which became known as “the machine gun war”. Although the Maxim Gun was first used in the Matabele War, Hiram Maxim truly changed history through the use of his invention in the World Wars. Among other rapid-fire weapons during the early 20th century, the Maxim Gun was regarded as the deadliest and psychologically deprecating design. This was largely due to the recoil-operated firing system which used the recoil of the gun itself to reset the action and maintain a continuous rate of fire. Although the Gatling Gun was the beginning of trench warfare, the Maxim Gun in World War I forced militaries to change their tactics fully to trench warfare simply to avoid being slaughtered. Military commanders would set the machine guns up on either side of the battlefield and aimed the guns where the enemy would be to unleash an endless array of bullets into the flanks of their enemies. They referred to these areas as “killing zones”. Commanders throughout history had won battles by sending massive groups of men into battle and overpowering their opponents in this way. This had been largely successful throughout history due to the lack of rapid-fire weaponry. This naturally became ineffective with the introduction of the Maxim Guns as the rapid-fire bullets would tear through any amount of men that was thrown at them. It is depressing to note that WWI commanders continued to try this approach throughout the duration of the war. The guns had been heavily revolutionized over the early and late 19th century with the introduction of rapid-fire weaponry like the Maxim Gun and the high-power and semi-automatic Colt revolver. To make note of sometimes overlooked advancements in guns over their timeline, it worth to mention the revolutionary Minié ball. This improved the bullet from a simple, round ball into a slug that had a concave bottom that expanded when fired so as to grip the inside of the gun barrel more effectively. This expansion added to improve the spin of the slug which improved its accuracy and the elongated and pointed nose of the bullet proved to give it better aerodynamics which greatly increased the range of the bullet. The next item would be one that finally replaced the unreliable flintlock system that had pervaded through the 17th and 18th centuries. These replacements were called percussion caps. Percussion caps were invented shortly after the discovery of fulminates in 1800, which were compounds like mercury and potassium that were discovered to explode on impact. The percussion cap was a bronze cap that would be smacked by the hammer causing a spark that ignited the gun powder and fired the projectile from the gun. The last item of note to revolutionize gun use in the 18th century was the improvement of the bullet cartridge. Prior to the cartridge, soldiers were reliant on shoving the bullet with wadding and gun powder into the gun after each shot to be able to fire once again. However, there is evidence that suggests paper cartridges were used as early as the 14th century. That is to say, the soldier had pre-wrapped bullets with gunpowder in the paper that they shoved into the barrel. In the 1847 B. Houillier patented the first metal cartridge that would be ignited and fired from the smacking of the hammer from a percussion cap ignition. Although the telescope was invented by Galileo in 1608, rifles just didn’t have the range or practicality to have an optic deemed necessary. There are reports of soldiers adding homemade scopes onto their rifles but they were hard to zero and even harder to use effectively. The idea of rifle optics or the “sight” didn’t come into serious play until around 1835 and 1840. Nowadays, you can fit all sorts of fancy optics to your personal AR-15 and gun enthusiasts everywhere are always looking for the best rifle optics to fit their AR-15, which is the standard gun in today’s world for recreational purposes. As time progressed through the 20th century, guns continued to progress in a similar fashion as back in the 13th century. This is to say that the concept of the Maxim machine gun was improved upon to form a less powerful but same concept type of weapon that could be easily carried and handled by a soldier trekking through any level of terrain. This is similar to how the cannon was adapted into the hand cannon. These advancements include guns like the famous “Tommy gun” or Thompson machine gun by John T Thompson. The Tommy gun actually lacked in popularity because it was invented as WWI ended and was primarily used by mobsters in gang wars. John Thompson was saddened to see the gun in such a way and never got to see its use into the second World War as he passed away in 1940. The semi-automatic rifle, the AR-15, rose to fame in 1959 when Armalite sold the design to Colt Manufacturing. It is useful to know that the AR is an abbreviation of Armalite and doesn’t stand for “assault rifle” or “automatic rifle”. It is used today as the modern sporting rifle in hunting and recreation. This gun has received a lot of distaste from the public and has had the term assault rifle slapped on it, potentially by anti-gun legislators trying to place bans on the gun due to it being used in mass shootings. The term assault rifle is believed to be coined by Adolf Hitler during the WWII era where he called the MP43 the Sturmgewehr which means assault rifle in English. Gun owners adamantly oppose any ban that may be attempted to be imposed upon the AR-15 and argue that is purposed for hunting and recreation, being a semi-automatic rifle. This means 1 bullet per trigger pull. Gun enthusiasts often look to find the best AR-15 rifles on the market, as well as other guns, when they are looking to expand their gun cabinet. Moving forward on the timeline in history into the future we can expect the world of guns to experience further improvements upon the basic designs that were initiated in the early 13th century. We can expect to see further advancements in the sights for accuracy, designs to address bulkiness and increase the mobility and reloading speed of the weapon, and more potent and lethal designs for use by military excursions. The history of guns holds a very exciting piece over the course of history as they started out from literal sticks spitting fire to the fine-pointed high-end pinpoint accuracy of a single bullet that we see in today’s modern weapons. Whether you determine if a gun should be a common household item or not, you are now well informed on the history and the origination point of guns in general. Having a deeper understanding of where guns come from you can now hold a better understanding of where they are now, and perhaps more importantly, where they are going.